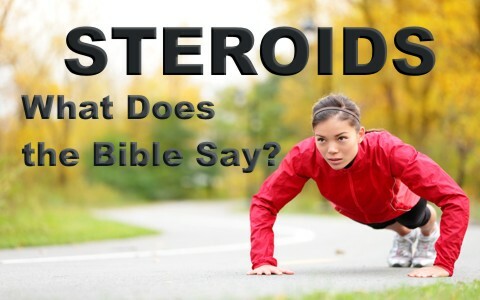 What Does The Bible Say About The Use Steroids? Does the Bible say anything about the use of steroids, and if not, how can we determine if they are acceptable to God or not? Our bodies have been described as the Temple of God because God the Holy Spirit lives in every believer, so today, we don’t need a temple to worship God in because we can worship Him anywhere and any place we choose. This doesn’t mean we don’t need the church because the church is the Body of Christ and Jesus said that the gates of hell or death won’t stop it from surviving (Matt 16:18), so we know the church still exists today and we are to be part and parcel of the church, doing what Christ commands the church to do (Matt 25:34-40; 28:18-20; James 1:27) and is not possible for “lone ranger” Christians to do, but every person who’s been brought to repentance and faith has the Spirit of God living in them, so you and I are a living, breathing temple of God, not because of who we are but because of Who God is and His Spirit living in us. The Apostle Paul asked a rhetorical question of the Corinthians and wrote, “Or do you not know that your body is a temple of the Holy Spirit within you, whom you have from God? You are not your own” (1st Cor 6:19), and “that you are God’s temple and that God’s Spirit dwells in you” (1st Cor 3:16)? Of course he means God live in them (and us) because “God’s Spirit dwells in you” and me, so we are “not in the flesh but in the Spirit, if in fact the Spirit of God dwells in you. Anyone who does not have the Spirit of Christ does not belong to him” (Rom 8:9), but “while we were living in the flesh, our sinful passions, aroused by the law, were at work in our members to bear fruit for death” (Rom 7:5), so even though today “we live in the flesh, we do not wage war according to the flesh” (2nd Cor 10:3). Instead, ours is a spiritual battle against enemies and wickedness in high places or in places of authority. This can easily be seen with the secularization of the American society as well as the world. The world is growing increasingly hostile to anything about God, and Jesus’ name is now forbidden to be spoken of in public meetings or sometimes, even in the public square, so today, I would say, especially today, we need all of God’s help that we can get. There is so much steroid use today among athletes that it puts the honest athlete at a disadvantage and steroid use isn’t just being used by professionals. It has made its way into the high school locker rooms and colleges too, but the truth is our bodies don’t actually belong to us. We were bought with a price and ransomed by Jesus Christ Himself (Mark 10:45). It probably saddened the Apostle Paul when it was “actually reported that there is sexual immorality among you, and of a kind that is not tolerated even among pagans, for a man has his father’s wife” (1st Cor 5:1), but why would this bother Paul? Openly sinning, and particularly with sexual immorality, has no place in the church. In fact, people can be disfellowshiped or excommunicated for this, but excommunication is done in the hopes that they would repent and leave their sexual immoral lifestyle. Those who don’t repent of this are headed to the fierce judgment of God (Rev 21:8), so any other sexual contact other than with your spouse is a grievous sin because they are sinning against their own body. This is why Paul writes, “I wrote to you in my letter not to associate with sexually immoral people— not at all meaning the sexually immoral of this world, or the greedy and swindlers, or idolaters, since then you would need to go out of the world. But now I am writing to you not to associate with anyone who bears the name of brother if he is guilty of sexual immorality or greed, or is an idolater, reviler, drunkard, or swindler—not even to eat with such a one” (1st Cor 5:9-11), and so we are told, “Purge the evil person from among you” (1st Cor 5:13). There were huge problems with the church at Corinth. So much so that Paul frequently wrote about such sinful conduct, and wrote our “bodies are members of Christ? Shall I then take the members of Christ and make them members of a prostitute” (1st Cor 6:15), and said, “do you not know that he who is joined to a prostitute becomes one body with her? For, as it is written, ‘The two will become one flesh’” (1st Cor 6:16), so clearly we should “Flee from sexual immorality. Every other sin a person commits is outside the body, but the sexually immoral person sins against his own body”? (1st Cor 6:16-18), otherwise Paul asks, “Or do you not know that your body is a temple of the Holy Spirit within you, whom you have from God? You are not your own, or you were bought with a price. So glorify God in your body.” (1st Cor 6:19-20) Since we are God’s temple and to be living in holiness, how can we ever justify any foreign substances in our bodies? The truth is we cannot. Steroids, on principle, are sinful because they are changing the body for a purpose other than for glorifying God. That’s why we were created; to glorify Him and putting foreign substances in our bodies does not do this, and in fact, we have no right to do this since our bodies are not our own; they belong to God since they were bought with a price, Jesus Christ’s precious blood. For a Christian to take steroids for the purpose of building up their bodies is sin. We are the temple of God and His Spirit lives in us, so we ought to treat our bodies just as they are; the temple of the living God. Of course, if a doctor prescribes steroids for time and for specific medical purposes, that’s a different issue because the user is not doing it to build themselves up but to speed their recovery, so taking steroids cannot be justified or rationalized by the believer unless under medical supervision and only for a time. We can grieve the Spirit of God by using steroids, and besides, our body is not our own so we are not free to abuse it…and the use of steroids does just that, and in principle, it is sin. Here is some related reading for you: What Does the Bible Say About Drugs? Previous post: What’s The Difference Between Godly And Worldly Sorrow? Next post: I Have Faith, So Why Didn’t God Answer My Prayer?